Andrew Logan’s work looks familiar. We think we know it. It reminds us of so many things. Mirror balls eradiating white squares of light at an afternoon tea dance, rows of glass mosaic elephants on an faux-Oriental market stall, porcelain-faced effigies of the Virgin Mary in a Spanish church frocked in stiff, gold-lacquered lace and the racks of hologram postcards of a winking Jesus in a Mexican souvenir shop. And then there’s all that glitter, heavy with nostalgia for primary school Christmas cards stuck fast with Gloy. It’s ten years since the re-launch of the Ruthin Craft Centre and Logan’s inaugural show there, making Cornucopia a kind of revisited retrospective with some new work. It’s a good move. There is something so delightfully celebratory about Logan’s oeuvre. A real crowd-pleaser. It’s big, it’s brash, it’s bold and it’s kitsch. Rajas Zandra, 1982, a huge resin sculpture of Zandra Rhodes in a lurid-green dress stands in the centre of the gallery, her outspread hands aping those of an Indian goddess. Beside her, resting on a low plinth, is Zen Garden, 2008, a long oblong of gold, mosaicked glass encrusted with cabochon-like jewels. It’s the most abstract piece, says director Philip Hughes, but they get it, people absolutely get it. Indian influences are rife in wall-hung pieces such as a peacock, whose tail feathers are embedded with a line of sepia photographs of the Taj Mahal, and two winged-horses similarly adorned with images of Lucknow. And in Temple to the Sun, a free-standing (and what can only be described as a) glorified drinks trolley sprayed gold, with china-faced dolls serving as caryatids. Andrew spends a lot of time in India, explains Hughes, they love him there. 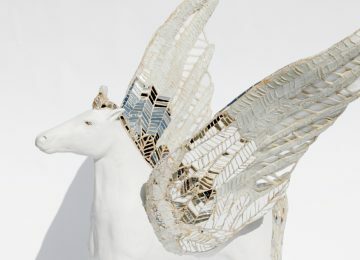 Birth, Life and Death, 2007, three immense winged horses in red, black and white dominate the semi sectioned-off part of the gallery, their wings shimmering with mirrored glass. Glass mobiles of suns and crescent moons, such as those from the Universe of Smiles, 1987 series, hang here too, casting shadows against the walls as they turn. They are unashamedly jubilant, the smiling sun as outwardly facile and light as a child’s scribble. Such pieces appear to ask little of the viewer but to enjoy them. Their apparent ease of construction and mish-mash of recognisable found things increases their accessibility. Anyone could do it, we think: it is just the stuff of play-time, dressing-up boxes, papier-maché and colouring-in but bigger. Not so. Theatrical smoke and mirrors not only obscure Logan’s finesse but the intelligence of his iconography and indeed, at times, iconoclasm as well. Think of the work of the Surrealist Joseph Cornell with his boxed, seemingly random juxtapositions of curiosities and that of the film-maker Derek Jarman. Hanging from the ceiling is Joy from Earth to Sky, 2001 a weighty amber cross, its centre a broken ceramic plate, stuck with crucifixes, while on the wall opposite is the breath-taking Good Friday, a painted mirror encased in a white-washed ornate gesso-frame featuring three tiny exquisitely winged Christ figures ascending to heaven. Cornucopia is quite simply a joy.